Tucson head coach Marcus Coleman (left) and majority owner Kevin Guy. It took less than three weeks for Tucson's new Indoor Football League to put a new head coach at the helm. 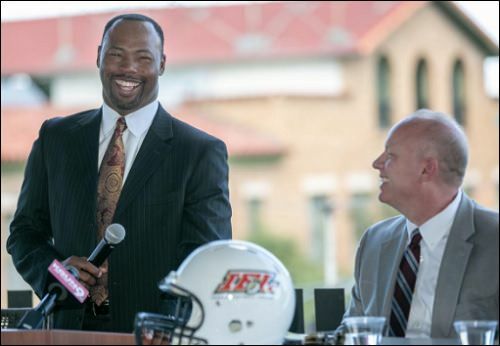 Former Iowa Barnstormers defensive coordinator Marcus Coleman, an 11-year veteran of the National Football League, has been named Tucson's first head coach, the team and the IFL announced today. Tucson announced the formation of an expansion team to start play in the IFL in 2019. The team is owned by Kevin and Cathy Guy. Kevin Guy will continue to serve as head coach of the Arizona Rattlers. Under Coleman, the Barnstormers' defense allowed a league-low 35.2 points per game, and surrendered just 63 touchdowns, in 2018. The 63 touchdowns allowed were 14 better than the 77 allowed by the Rattlers. The Barnstormers won their first-ever United Bowl Championship, 41-38 over the Sioux Falls Storm, in July. Coleman was drafted by the New York Jets in 1996, and spent time with the Houston Texans and Dallas Cowboys during his 11-year NFL career. His seven interceptions for the Texans was tied for fourth in the league in 2003. His first IFL coaching position was that as the defensive backs coach with the now-defunct Tri-Cities Fever. "This is a great opportunity for me to bring my experience and philosphy of hard work, mental toughness and pyhysical play to our team as we establish ourselves in this league," Coleman said in a press release on the IFL's official website. " Our team will be exciting to watch, and the goal will always be to win a championship for Tucson." Submissions to name the expansion team ended today. An announcement on the new name, as well as a color scheme and logo, are forthcoming. The team will play at the Tucson Events Center in an arena which has a seating capacity of nearly 9,000 persons. The arena is also home to the Tucson Roadrunners of the American Hockey League. "When we launched the search for our head coach, we wanted to find a leader that could take us to where we want to go. I am confident we have found that in Marcus Coleman," said Kevin Guy in the IFL press release. "He has been preparing for this his entire career and he is ready for the responsibility and its challenges." All six teams which comprised the IFL in 2018 are returning to the league next season; the Barnstormers, Rattlers, Storm, Nebraska Danger, Green Bay Blizzard and Cedar Rapids Titans. The Titans are going through a re-branding process under new ownership and general manager Ryan Eucker. The new name and color scheme for Cedar Rapids is scheduled to be revealed later this week. The IFL also announced last week that the Quad City Steamwheelers will be joining the IFL after a one-year stint in Champions Indoor Football. The possibility remains that there may be more team additions in the coming weeks, but most rumors have neither been substantiated nor confirmed. The Indoor Football League was founded in 2008. It will embark on its 11th season in 2019.